OK, while this one may not be the one you've been waiting for, the near simultaneous release of new graphic novels by Dan Clowes and Pete Bagge (on top of last month's Hernandez Brothers love fest) has us remembering the days twenty years back when Bagge and Clowes were much more closely associated in the the minds of the comics reading population than is the case today (although the fact that Other Lives sports a lone front cover blurb from Clowes demonstrates that a link between them nevertheless remains). 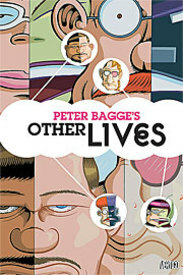 Unlike Clowes, Bagge has eschewed formal inventiveness in his art and has instead continued to employ his personal and highly expressive comics language to tell twisted tales of (more or less) everyday people. 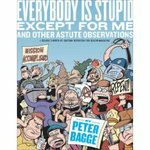 But, like Clowes, Bagge continues to focus on harnessing his cartooning skills to mine the rich vein of his unique and original comics language in the service of delineating character. In Other Lives he has crafted an elaborate plot that explores the fungibility of individual identity in the internet age and that demonstrates the deformative effects of secrets, lies and Second Lives™. It is an assignment which, when you stop to think about it, is one that comics is ideally suited for.